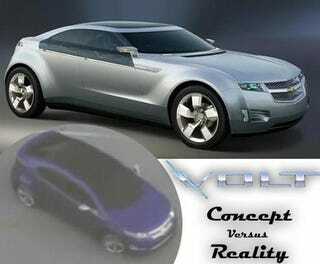 The 2010 Chevy Volt has been a landmark project not only for its daring powertrain and breakneck development cycle, but also for GMs general openness with the media during the process. Along the way we've been invited in to see the development first hand, even spending a whole day with the Chevy Volt. But despite the buddy-buddy, easy-publicity PR maneuvering, up until the wee hours of this morning, we still didn't know what it looked like. Now that we've seen it in all but minute detail, it's time to compare the concept against the reality. Given that the original concept body had terrible aerodynamics, a radical change to the front end was not unexpected. In truth, the front corner of the Volt has been getting the Lutz-style sneak preview for months now; so too the smooth, swept-back corners and flush-mounted headlights. It appears the intake detail at the base of the windshield is retained and the lower grille grows to the main intake, with the side intakes flanking. It's hard to tell from the grainy video footage, but it appears the tail end of the Volt gets a lot of the same look as the original. The thin, horizontal tail lights remain, and the glass may remain or it might be a black insert, but the rear styling elements of the concept are retained. The gray plastic lower bumper seems to have been removed (darn) in favor of body-colored style, and more than likely the exhaust tips are more traditional that the big center exit on the concept. The dominating, all-glass roof of the concept is carried over but we cannot yet speak to function as seen in the side view images (Pointed out by the keen eye of majred) and given a coat of dark tint. We can also see that the roof goes all black, abandoning the body color stripe running from the C-pillar up the roof line and across the windshield. Also apparent is that they've maintained the strong character lines at the base of the rear which joins the C-pillar, fender, and rear deck planes. This might be the view with the most significant changes. Gone are the dramatic fender flares and almost inconceivable side glass, replaced with far more tasteful and production-friendly shapes. Despite the changes there, the car maintains what we assume to be a plug-in port just ahead of the base of the A-pillar (on the drivers side — we're betting there's a "Volt" logo on the passenger side). This view also more effectively illustrates the removal of the wraparound band of color we talked about earlier. To be perfectly honest here, we can only talk about half of the side view since the angle on the video helps us zero. As we mentioned in the earlier post from the first leaked images, the side glass gets a fairly nice, if not conservative, treatment, abandoning the ridiculous, un-roll-downable side glass. The plug-in port and rear view mirror are visually joined and will probably act as a signature design element, pointing out the car's plug-in-ability. Well, so far the interior looks nothing like the concept version, and we're not sure how we feel about that. Though a larger percentage of Jalops worship at the altar of Mac, I'm torn over this obviously Apple-inspired center stack. If it's got haptic feedback hiding beneath those touch sensitive buttons, we'll herald it as the greatest ergonomic design in decades, if not, we expect it to be slick, but ultimately confusing on a daily use level.